The tour will be an interesting experience for clients to discover sightseeing as well as local living style along Mekong River. It will take you into the heart of Mekong where the beauty of the river and friendliness of local people create unforgettable river life experience from Vietnam to Cambodia. Today you start your journey to discover Mekong River. Leave bustling Saigon for the 3 hour drive to the delta town of Cai Be. On arrival, board your boat for cruise in the Delta’s waterways. Along the way you visit the many fascinating local cottages industries including rice paper makers, sweet factory, bonsai nurseries. After a huge lunch at an orchard you weave your way through the intricate network of canals which are the lifeblood of the Mekong Delta, to Vinh Long. At this small town you meet up with your vehicle for a short drive to Can Tho - the heart of Mekong delta. Check in hotel and free time. Wake up in early morning to take the boat trip to Cai Rang Floating Market - one of the most bustling floating markets in Mekong Delta with hundreds of small boats barging. At the market, most active in the early morning hours, you will see boats of all shapes and sizes laden with local produce and all jostling for business. Continue your boat ride, stopping at some local orchards where you will have an opportunity to sample some delicious tropical fruits and visit with a local orchard farmer at his modest home. After that, continue your journey to Chau Doc, close to the Cambodia border. On the way, you have chance to visit Bang Lang Bird Sanctuary or Crocodile Farm. Upon arrival, head up Sam Mountain for a spectacular view over the rice paddy fields toward Cambodia. Following the breakfast at hotel, you take an early speed boat to Phnom Penh - the capital of Cambodia. Upon arrival, you will be welcomed at the harbor and transfer to your hotel. Late afternoon, enjoy 1 hour of interesting tour by tricycle along the Tonle Sap riverfront. Have dinner at the local restaurant before back to your hotel. Situated at the confluence of the Mekong and Tonle Sap Rivers, the Cambodia's capital city look like a big village - town where French colonial influences can still be seen in old buildings restored. Start your city tour with a visit to Royal Palace. The Palace was opened in 1870 under King Norodom, and now contains the Royal Residence, the Throne Hall, the Silver Pagoda, and other buildings. The Silver Pagoda (Wat Preah Keo Morokat) is one of the city's most visited sites and offers a display of priceless Buddhist and historical objects. Afternoon, you visit to Toul Sleng museum (S-21) and the killing field of Choueng Ek, which is about 35kim away from the city. These places are grim reminders of Cambodia's bloody past under Pol Pot. It is almost inconceivable to confront the nature of true evil here in this gentle land, but the Buddhist memorial at Choeung Ek, commemorates the 1.7 million victims of the 1975-79 Pol Pot regime. This excursion may prove distressing for some. Back to your hotel in the late afternoon. Leave Phnom Penh for Siem Reap by boat to continue discovering the Mekong river. Upon arrival in Siem Reap, you will visit the incredible temple Ta Prohm. There are enormous fig trees and gigantic creepers which embrace themselves in the stone foundations of the structure giving the impression of man's creation being reclaimed by the powerful forces of nature. You also explore the grand circuit with Preah Khan, Kravan, Neak Pean, Krol Ko, Ta Som, East Mebon and Pre Rup Temples, where you can enjoy the sunset. Breakfast at the hotel - drive to Choueng Kneas village, where you will take the boat to visit the way of life Cambodian poor people along with schools, restaurants, hospitals and much more floating on the great lake of Tonle sap. Transfer to the airport for the flight departure. Speed boat Chau Doc - Phnom Penh, Phnom Penh - Siem Reap. 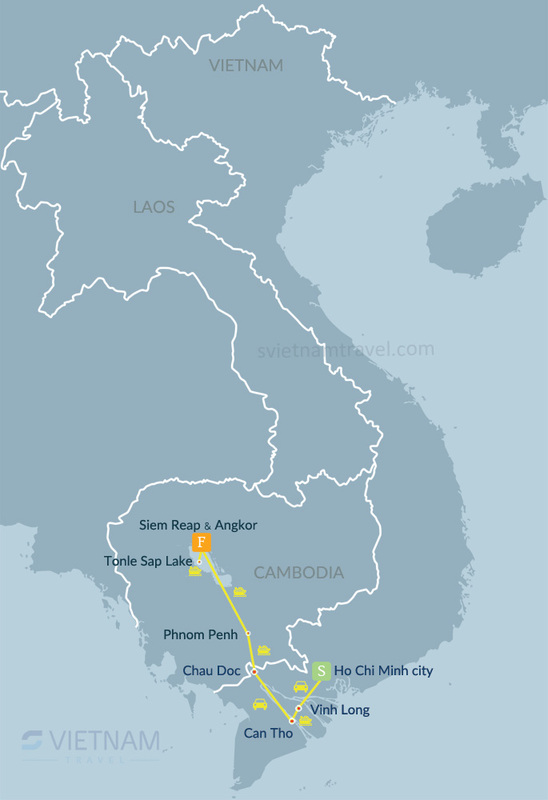 It is easy to combine Vietnam and Cambodia from Ho Chi Minh city. Start the tour from busy commercial city Ho Chi Minh with some excursion to Cu Chi tunnels, Mekong delta.. This trip will provide you a chance to visit 2 country in 1 weeks with some highlights as: the peaceful capital city - Hanoi, world natural heritage - Halong bay, another..